52,255 fans all donning red packed Busch Stadium in St. Louis to see Tony Larussa’s Cardinals (95-67) take on Bobby Valentines New York Mets (94-68) in Game One of the 2000 NLCS. 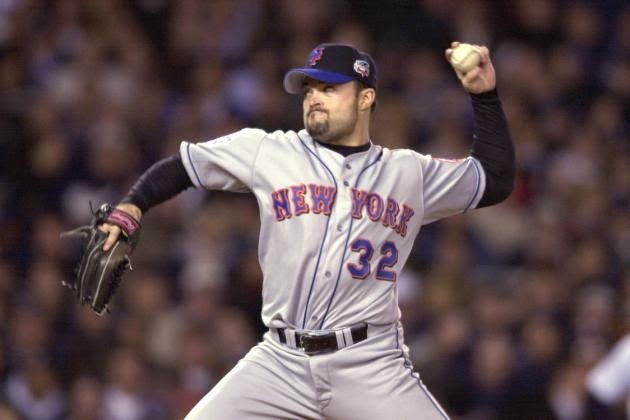 The starting pitchers were Mike Hampton ( 15-10 / 3.14 ERA / 151 Ks) for New York against St. Louis' Darryl Kile (20-9 / 3.91 ERA / 192 Ks). 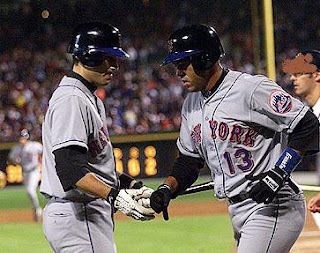 The Mets struck Kile in the 1st inning, the teams newest hero, leadoff man; Timo Perez, who came out of no where filling in for an injured Derek Bell, doubled. Kile threw a wild pitch then walked Edgardo Alfonzo. 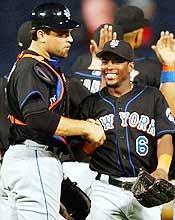 The Mets MVP; Mike Piazza then doubled tp left scoring Perez with the first run of the series. Alfonzo moved to third on Piazza’s double and scored on Robin Ventura’s sac fly. Quickly it was 2-0 Mets. In the 5th, Mike Hampton, always a good hitting pitcher, got an infield hit. He moved to second on a ground out & then scored on Alfonzo's RBI single, making it 3-0. The Mets added two more runs in the 9th inning on solo HRs from Todd Ziele & Jay Payton. Mike Hampton pitched himself a great game, going seven innings without allowing a run. He struck out four, walked three & allowed six hits. He got his first post season win and would eventually be the NLCS MVP. John Franco pitched a scoreless 8th & Armando Benitez closed it out, but not before giving up two runs. Mets took Game #1 with a 6-2 win on the road.